Recientemente renovado gran condominio de 2 dormitorios / 2 baños con cama King size en Master, el dormitorio 2 tiene 2 literas de tamaño completo, 1 cama individual y una cama grande en la sala de estar. Totalmente equipado para hasta 9 personas. El Princesa de Penasco Resort es la vida en la playa en su máxima expresión. Cuando miras desde tu apartamento, ves el hermoso Mar de Cortés, impresionantes vistas del paraíso desde tu tercer piso, balcón extra grande, área de comedor, sala de estar o dormitorio principal. Hermosas playas, golf, alquiler de motos de agua, montar a caballo en la playa, conducir Quads en el desierto y disfrutar del encanto de México. El Princesa Resort tiene un gimnasio, 3 piscinas grandes, una climatizada, tres piscinas para niños y una bañera de hidromasaje donde podrá relajarse y conocer a otros vacacionistas. Hay una sección de la playa solo para los visitantes del complejo, por lo que siempre puedes tener tu propia parte de la playa para disfrutar con tus invitados. ¿Qué tal un masaje en la playa? Sí, para poder tener eso también. La Cantina de Colin está justo en la propiedad. Realmente es el "bar-restaurante de la esquina local". Sirviendo el desayuno, el almuerzo y la cena, Colin's es también el lugar para presentarse para ver el juego, algunos tacos de pescado fresco y algo frío de barril. Están abiertos los siete días de la semana, con Happy Hour de 4pm a 6pm con un agradable patio al aire libre. 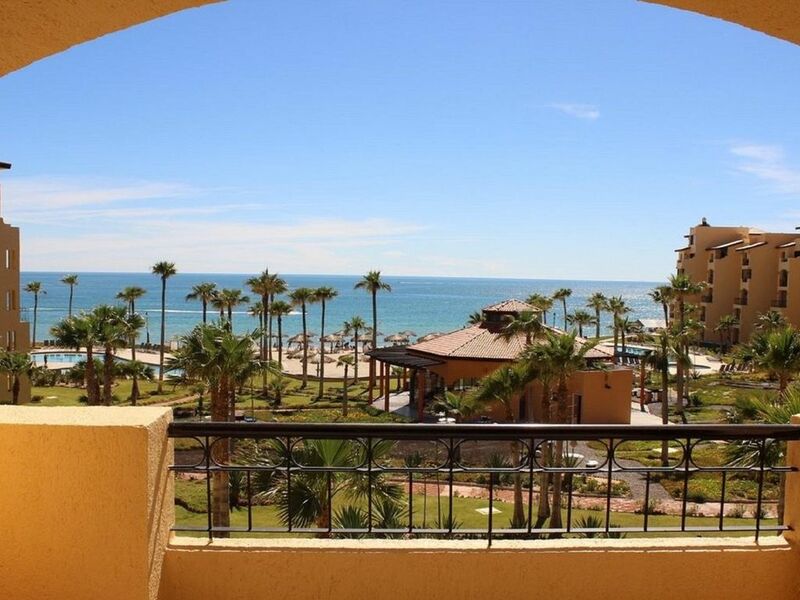 Este complejo está a solo unos minutos del puerto pesquero activo de Puerto Peñasco, donde podrá disfrutar de varios restaurantes, tiendas y clubes con sus amigos o familiares. Recoja algunos camarones o pescado en cualquiera de los vendedores en el Malecón. Este condominio es grande (1150 pies cuadrados) y cuenta con vistas espectaculares. El condominio tiene una cocina completa con encimeras de granito, electrodomésticos de acero inoxidable con nevera, microondas, lavavajillas, horno / estufa; y una sala de lavandería con lavadora y secadora. ¿Quieres relajarte y ver una película? Hay televisores de pantalla plana en la sala de estar y cada dormitorio y Netflix está en vivo. ¿Necesitas estar conectado? Hay un buen servicio de Internet con un enrutador dedicado y WiFi en el condominio. seguro es proporcionar para ordenadores portátiles y todos los demás objetos de valor. El Complejo tiene seguridad COMPLETA, usted pasará a través de 2 puertas de guardia, complejo completamente amurallado y patrullas de seguridad. Ahora relájate! ¡Disfruta de la vida en la playa de México! Not good for 2 couples. Not cleaned when we arrived at 4:30 pm. Small bedrooms. Queen bed in master with small window with locked cupboards surrounding it. 2nd bedroom had bunk beds dissembled to make 2 twins - not so much fun for the spouse to climb in & out. Even my "twin" was uncomfortable. Lamp had a broken switch between the beds. Unfortunately it was cold for February, so not much enjoying of the little deck. Also, MAJOR construction happening on the property & was not told about it until the day we left from Tucson. Would never have agreed to staying there had we known. Only 1 pool was heated & it was in front of another building. Possibly a good place for a couple with small children. Only used refrigerator and coffee machine. But hot water & thirsty towels for showers. Oh, BUT BRING YOUR OWN SOAP! My sincere apology for the condo not being clean when you arrived. My staff had the condo clean within 2 hours of your notifying me. My staff is very good and this is the first time this has happened in the year I have used them. I have addressed the mistake with them. The bed in the master bedroom is a California King Bed. Not a Queen Bed. The small locked cupboards in the master bedroom are called owners closets. Someone recently tried to pry the locks open and caused damage. Guests are provide a full size closet with 25 -30 hangers and a 6 drawer dresser. Suit cases can be stored in the cupboards next to the bed. My VRBO description and pictures clearly show 2 twin beds in the 2nd bedroom. Any items could have been repaired or corrected within a few hours, if you had notified me. I have a maintenance man that is local. So the light switch and soap could have been replaced or provided. I notified you of the delay in the 20th anniversary revitalization project as soon as I was notified that the project was 2-3 weeks behind schedule. This project includes resurfacing all the pools and hot tubs, new walk ways, new bathrooms in the club house, new outside showers near each pool, new shade structures near the pools and a swim up bar for the E building pool, new grill areas and even a Bocce Ball court. I did some upgrades to my condo last week when I was in Mexico. I added brand new full- size bunk beds and mattresses in the second bedroom. I also purchased all brand new pillows and linens for the full-size beds, and 8 bath new towels you liked so much. I also added USB charging in the maters bedroom, at the alarm clock and the kitchen. You can now charge 6 cell phones or tablets at the same time. I certainly cannot control the weather or construction in Mexico. I do own 2 condos. One in Galveston Texas and Puerto Penasco Mexico. Combined I have over 80 5-star ratings and 42 4-star ratings. I take great pride in making sure my guests enjoy their stays. Property was as described, clean and a nice location. Stayed for three days during the off season. Very quiet and secure, easy beach access. Some renovation work going on but didn't have much impact on the stay. Owners were quick at answering any questions asked before and after the stay. The restaurant on site was very friendly and food was good. Would stay there again. Great view with shade in the morning and sun in the afternoon. Well stocked kitchen(meaning pans, glasses dishes.) comfy beds. TVs in every bedroom and living room. WiFi was good. Thank you for the kind words and your note about how much you enjoyed your stay. Please come back and stay with us again. Nice condo, very clean, beautiful view, nicely stocked kitchen! Only negative was we could definitely have used more bath towels, hand towels and washcloths. Very nice overall experience, quiet and peaceful. Thank you for your review. We are glad you enjoyed your stay. The condo is stocked with 6 bath towels, 6 hand and 6 wash cloths. The washer and dryer in the condo is provided for you to uses, to make sure you can have fresh towels daily if you require them. We appreciate your kind words about your stay and the beautiful beach and condo. Please come back and stay with us again! We really enjoyed this condo. It was very clean and had everything we needed. This was our first time staying at this resort. Very quiet and clean. Pools were warm and well maintained. House had TV, WIFI, Netflix etc. David was very responsive and helpful. We would rent this condo again! Perfect location, perfect views... I didn't want to leave.